An exciting societal shift is taking place in relation to how we look after our health and well-being. Increasingly, we have people coming into our pharmacies to seek advice about minor ailments and treatment options from our healthcare experts. This year saw the launch of the #SelfCare initiative organised by the Irish Pharmacy Union (IPU) and the Irish Pharmaceutical Healthcare Association (IPHA). The event was held in light of new research that demonstrates consumers are increasingly willing to take charge of their health, leading to a more effective and efficient healthcare system. This initiative sets out a range of proposals for a more focused approach to self care which could lead to better patient outcomes and considerable savings for the State as turning to pharmacists for medical advice could help to reduce waiting lists at GPs and hospitals. Research demonstrated by yesterday’s publication, which is based on research from Behaviour & Attitudes, illustrates that there is a clear desire from the majority of Irish people (92%) to be involved in their own self care. Furthermore, the IPU recognises that the role of community pharmacists is pivotal to the successful development of self care and its more widespread adoption. The healthy Ireland strategy is a major Government-led programme which aims to encourage and support everyone living in Ireland to have the best possible physical and mental health and wellbeing. The information will be a good foundation for people looking to self care. Furthermore, discussing your health with your local pharmacist, and building trust with them to offer expert advice for you and your loved ones, will put you on the right track to making self care a common aspect of your life. 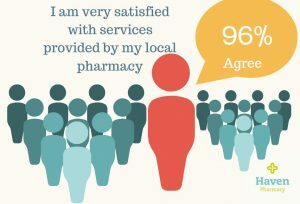 The purpose of this information and indeed this initiative, is to emphasise the changing nature of your local pharmacy. With continued hard work, pharmacies hope to be able to expand on their provision of treatments for minor ailments within local Irish communities. Self care is a preventative method of looking after your health – while you have it, so that you can avoid illness/disease later in life. Expert advice is available in all Haven Pharmacies across Ireland. Our pharmacists will take the time to listen and offer advice on how you and your family can self care. Call into your local Haven Pharmacy to discuss self care and the role of the pharmacist for you and your family. Our pharmacists will provide great-quality, trustworthy information so patients can seek care at the appropriate level and enhance their independence within the healthcare system. A full copy of Self Care – taking charge of your health can be downloaded from www.ipu.ie and www.ipha.ie. The meeting heard about a unique Swedish IT-based self-care initiative that reaches 70% of the Sweedish population, which builds a ‘flu’ map and encourages patients to visit pharmacies for prevention and treatment. Jonas Vikman of LIF, the Swedish pharmaceutical trade association, on a unique predictive health campaign they ran with the retail pharmacy association in Sweden. Treat yourself with advice from your pharmacist analysed real-time data to track where people were accessing online information on colds and flu. From this, they built a ‘flu’ map of Sweden, which was constantly updated and was used to target online advertising on the benefits of visiting a pharmacy. It is estimated that the campaign reached 70% of the Swedish population. It also promoted a valuable public health issue by conveying the message that antibiotics were ineffective in tacking colds and flu.